This entry was posted on Thursday, May 22nd, 2008 at 12:03 am	and is filed under News. You can follow any responses to this entry through the RSS 2.0 feed. You can leave a response, or trackback from your own site. 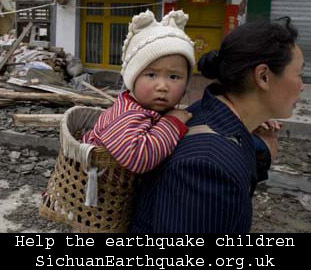 Find out why the relatively new school buildings collapsed worse than the much older structures? Any kickbacks [bribery] involved when they were built? Also ask: Why most of government officials’ children who study abroad [full-time] drive most expensive European cars to schools while they themselves are not making any money at all? Where the money came from?? Ask: Can PRC become a great nation while the common practice of taking kickbacks & bribery by govt. officials go on as usual? I am a friend of China. I believe there will be investigation into this matter and perhaps trails of those who were responsible. People are asking questions. The Liu Han Hope Elementary school’s story was initially reported by Li Chengpeng, a journalist and sports commentator, on his blog. Yesterday I read the blog of Han Han (an influenrential writer and blogger) who drove to Sichuan himself to help. He suggested the collapsed school building should be kept as a memorial to the children, as well as a warning to those are to build new schools. ” the Motorola i1 from Increase Mobile(Ur) brings fresh meaning to the phrase.